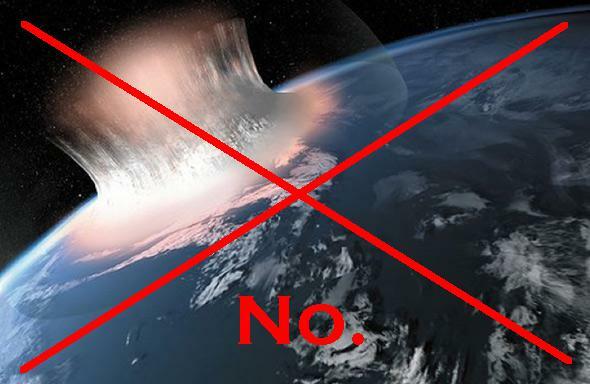 CNN iReport: Fake story about a killer asteroid impact in 2041. Needless to say, I was immediately suspicious. I think I would’ve heard about this rock from any of a large number of friends of mine who look for such threats for a living. Then I read the article, and knew for sure it was just so much fertilizer. The article was very short on things you might need to get actual info—like, y’know, the asteroid’s name. The fact that the writer used an Internet handle (“Marcus575”) instead of an actual name was also a tip off that something wasn’t quite right. Then, the keywords for the article used were “beiber [sic], war, gaming, stocks, science, cyrus, space, obama, earth, states,” which may also have been a bit of a tell as to its accuracy, or lack thereof. The nail in the coffin would be the date listed for the impact: “March 35, 2041”. I have a screenshot I took of it, too, just for posterity. I sent a note to my friend Amy Mainzer, who happens to be the Principal Investigator on the NEOWISE mission, and she was, um, less than happy about the article. She pointed out that the largest asteroid NEOWISE has found is only 3 kilometers (2 or so miles) in diameter, a far cry from the 16 kilometers claimed in the article for this mysterious unnamed rock. Also, if an asteroid were found with a whopping 50 percent impact probability, every astronomer on the planet would be screaming about it from their rooftops. In reality, it would be very difficult to nail down an orbit that well 10 years out, especially if the asteroid were just discovered. There’s generally just too much uncertainty in the orbit’s exact shape to know what it’ll be doing a decade from now. It looks to me that the article was a hoax from the start. So how did it get on CNN? In my opinion, it’s pretty obvious that allowing unvetted reports posting under the CNN imprimatur is a terrible idea. It was only a matter of time before something like this would happen. In the screenshot, at the upper left corner of the giant graphic depicting a life-wiping-out impact on the Earth, there are the words, “NOT VETTED BY CNN” in small font, so I’m sure they feel relieved of responsibility. Seriously, it’s very easy to mistake the iReport pages for the actual CNN page. They really need a bigger banner delineating this from the official site. Or maybe one that says “THIS STORY MAY POSSIBLY BE FACT-FREE”. By the way, on the screenshot you can see that over a quarter million people saw that article! That’s a huge number of eyeballs. At least CNN eventually took it down, but it was more than a little late. CNN has taken a credibility beating lately. Its Boston Marathon bombing coverage, for example, and the nonstop and in some cases forehead-slappingly ridiculous coverage of the Malaysian flight going down were not high points for the network. This really doesn’t help. In my opinion this downhill slide started when it closed up its science coverage years ago and let go of Miles O’Brien. I make mistakes; we all do. But to have something like this—really, an obviously purposeful hoax—on a website attached to an internationally watched news source is a bit more difficult to forgive. As usual, if there’s asteroid news, your best bet is to try right here (or follow me on Twitter), on Universe Today, and of course NASA. If it’s big news like this and you don’t see it there, take it with a 10 mile wide chunk of salt.